It's hard to believe, but January is over and February is well underway. For those of us that made resolutions, it's time to revisit them and assess our progress. This year, I chose one word to be a mantra, a resolution for myself. And that word is "Balance." I chose this word to help me focus on balancing my life, my diet, my time, my sleep. One month into the new year, I'm still not feeling like I'm hitting the mark, but I am working on it. The year's not over yet. But there's another time to set aside some time for introspection other than new year. And that's the period of lent. As young children, we would think for weeks about what we were going to "give up" for lent. It had to be something we truly loved and never homework or brussels sprouts. Inevitably, my mom and I would always give up chocolate. But as I got older and started learning about our Armenian Orthodox faith, I started following the dietary restrictions for this period. A full vegan diet for 40 days. The first few years were tough, but now, we're so used to it, that's it's a welcome change for us as we bring our diets down to the basics in the idea of simplifying our lives. But it's not only about what we're taking into our bodies that we need to focus on, but also a look inward. I'll never forget a lesson I learned from one of my friends at church. This was about 6 or 7 years ago. We had just come out of church and were standing outside chatting. I don't remember what the conversation was about, but I turned to my friend and I started, "I shouldn't say this but..." and before I could say another word, he stopped me and said, "Then don't!" I always remember that. Yes, I was embarrassed for myself, but my friend was acting out of love...and he was so right. We had just left church. We had just taken the body and blood of Christ within us. So his "Then don't" admonition really struck a cord and I think of that day and his words often. And it's saved me on many occasions from gossiping. That year, besides our vegan dietary restrictions, I also gave up gossiping for lent. Not only not gossiping, but refusing to be part of the listening end as well. That's the tough one. But I learned something too. I learned that if I couldn't speak or listen to the bad comments about someone, that without the fueling by words of the negativity about that person, their shortcomings soon fizzled out and were forgotten. Isn’t that what we ask for ourselves? To be forgiven…for our misdeeds or wrongs to be forgotten? Once you remove that factor, you realize that we are all the same inside...with insecurities, and good days and bad. It's the very negativity of gossip that fuels that hatred and ill-will, and makes us unable to forgive or live up to our full potentials as Children of God. 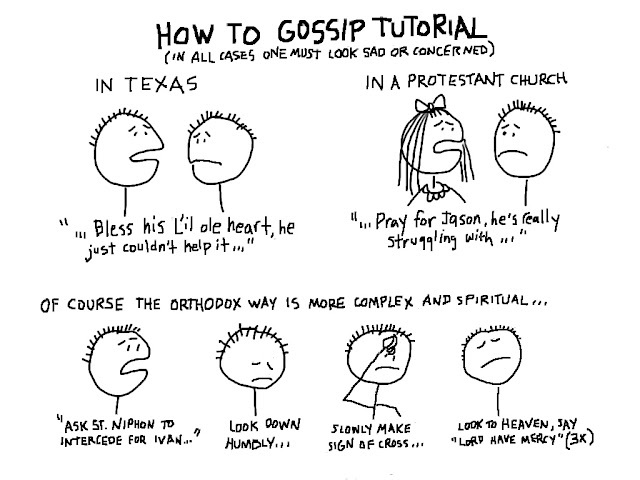 So my gossip restriction is something that I try to do year-round, but during lent, I am able to give it more focus. But it doesn’t need to be about that either. But more of an introspection on ourselves. What can we improve about ourselves? Maybe it’s having a little more patience with an elderly person in your life. Maybe it’s changing your attitude at work. Or a conscious effort to see the good in small things. How about spending quality time with God and setting aside a daily prayer time? Or taking a Facebook break and spending that time with your family or helping someone in need. The possibilities are endless. As we start our personal Lenten journeys, whatever they may be, let’s ask God for strength to show us how He sees us…and to work on those things that we fall short of. We are works in progress. Let’s embrace this Lenten period as a time of much needed renewal – body, mind and spirit. Oh! I almost forgot!! : If you're working on getting healthy (losing weight, exercising, etc. ), follow my new blog: the Journey of The Pudgy Pomegranate. Let's do this together! Truly! I looked up "gossip" images on Google, and look what I found! This is a great post. I am newly vegan and I never knew that about the Armenian Orthodox church. Very interesting. Gossip! my continuing struggle!